Gianni Garko plays Django in this highly impressive Spaghetti Western. German R2 DVD - from the Koch Media Django Boxset. The second part of a duo of Spaghetti Westerns produced by Luciano Martino, 10.000 Dollari per un Massacro is a minor chapter in the history of the genre - a small scale film, it would probably have been lost in the mass of films shot during the year, a new title coming out literally every week, except for its impressively written script. From the story's opening it is very hard to tell where the next scene will go and there are a lot of unexpected twists throughout - fortunately, unlike a cheap giallo title, these twists are not random jumps in logic or designed only to confuse, but instead help to create an unpredictable and very enjoyable storyline. The good writing also extends to the romance between Django and Mijanou which is far more believable than those in most similar Italo-Westerns, giving us a much better understanding of the characters and their actions - this stronger than average characterisation means that the film's climax is amazingly tense. Unfortunately, grating comic relief does raise its head a few times, even in the last shots of the film, but they are brief and the damage is kept to a minimum. With far more plot than action, the script does not give into the temptation that befell many similar films of including gratuitous gun battles - there are a few fights that are not completely necessary to the storyline, but they all help to build up Django's character. The film's pacing is relatively slow but it never drags. Interestingly the story would have worked well as a direct sequel to Sergio Corbucci's original Django (1966), partly thanks to the casting of Loredana Nusciak as Django's woman (she played the similar role of Maria in Corbucci's film). Romolo Guerrieri was a little known director in Euro-Cult circles but shows some real talent here, making good use of unusual camera angles but without going over-the-top and being distracting - unfortunately the editing is a little choppy in places and some scenes seem to end far too quickly, often giving the impression that the film is cut. Filmed in the usual places in Spain, the film looks great - especially the windswept final scenes. For the all important soundtrack composer Nora Orlandi provides a varied and very fitting score that suits the film perfectly. Gianni Garko made his break into Spaghetti Westerns with this duo of titles from the Martino brothers (the other film being Per 100.000 Dollari T'Ammazzo (1967)). Obviously Inspired here by the iconic Clint Eastwood "Man with No Name" 'strong silent type' look he doesn't have the confidence and cocky attitude that he would bring to the Sartana films, but he looks strong throughout and it adds to the film's layer of realism. He is joined again by the sadly short-lived Claudio Camaso as Manuel (wearing a most curious amount of mascara) and the familiar genre figure of Fernando Sancho as his father. The beautiful Loredana Nusciak is clever casting as Django's woman, all but reprising her role from Django (1966), while the rest of the cast contains some familiar Spaghetti Western faces. 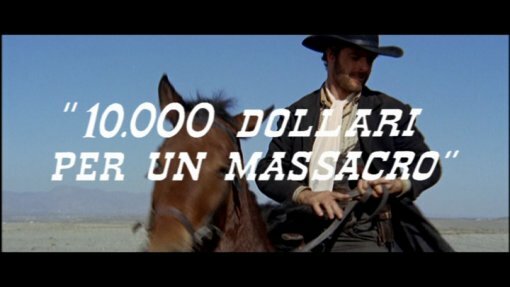 10.000 Dollari per un Massacro doesn't bring anything particularly new to the table, but a strong script, effective production and a solid cast make it highly enjoyable and raise it above the mid-card of Spaghetti Western titles. A must-see film for any fans looking to explore beyond the better known "Sergio" titles. Recommended. Directed by anyone	interesting? Romolo Guerrieri - a little known Italian director who also shot crime picture Young, Violent, Dangerous (1976) and Spaghetti Western title Johnny Yuma (1967). Any gore or violence? A little blood, plently of Western violence. Who is it for? Spaghetti Western fans should enjoy this. The picture quality is very good with only a minimal layer of grain and minor print damage. Audio Original German and Italian mono tracks, both sound fine. German is missing a few scenes which play in Italian. German for the missing scenes in the German soundtrack. Mondo Garko I - an interview with actor Gianni Garko as he discusses his career. In German, with German or English subtitles (24 minutes). Part two is included on the Per 100.000 Dollari T'Ammazzo disc in the boxset). Original German and Italian theatrical trailers. Spoiler filled. A brief, manually scrolling poster gallery. The soundtrack from this film is included on an audio-CD in the boxset. This disc is only available as part of the Django Italo-Western collection. Other regions? Japanese and Spanish discs. This is the only disc with English options and interviews. A much better than average Spaghetti Western, with a strong script and production. Recommended. An impressive looking and sounding release, with an interesting interview segment. Lack of English dub may annoy some, but the subtitles are error free. Unlikely to be bettered. Find the other films in the Django Italo-Western boxset. See our reviews of more Gianni Garko films and other Spaghetti Western DVDs. All text in this review written by Timothy Young - 13th February 2007.